Home/Wedding Ideas/Having A Wedding Sparkler Send-Off? Read This First! A few years ago I was the DJ at an extravagant wedding and the couple elected to have sparklers conclude their night.. The vision was simple. Hold hands and slowly make your way through the tunnel of lit up love. Photos are going off like it’s the paparazzi and people are giving you both their farewell shout outs. Well, it didn’t happen that way at this particular wedding. Everyone was handed a short grey stick to hold in their hand. As people started lighting them they burst into colors and smoked up the entire area where everyone was standing. Before all of them were fully lit, most of the first ones had burnt out. The smoke was so intense, I distinctly remember one of the grandmothers laying on her back on the ground coughing from the thick grey smoke. Photographers could only watch the chaos as they weren’t able to close the night with amazing exit photos. So how do you avoid this from happening? What can you buy instead? Professional wedding sparklers! Yes, they do make these and they are specifically designed for celebrations. They are much longer in size so they last longer and won’t burn out, plus they are virtually smoke free. This allows a smokeless, photogenic opportunity for an incredible send-off. If you buy the “4th of July” type sparklers, you can get all kinds of disasters. Unwanted colors bursting out as they light up, crackling ones, and even ones that whistle really loud. Can you imagine your entire guest list with one of these? 1.) Use a strong flame to light the first few sparklers. Those handy long Bic lighters work great and over-sized matches are good too. After the first few are lit, it’s faster to light sparkler to sparkler. Usually the venue staff can help with this step. 1 person at the front, 1 at the end of the tunnel, and 2 people in the middle on each side. 2.) Have someone call the limousine 15 minutes before departure time to make sure they will be in position at the conclusion of your sparkler tunnel. Assign the best man or wedding coordinator to make sure this is done. 3.) 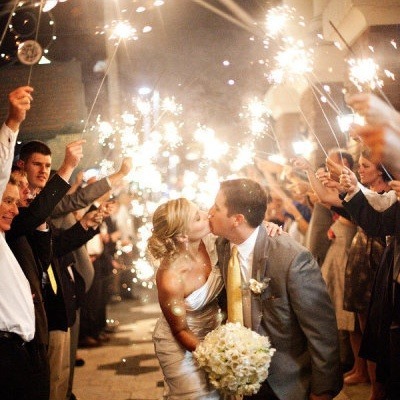 If you don’t want to be on the venues bad side, have buckets of sand or water available for the burnt out sparklers. Littering the property with burnt out sparklers could mean an additional clean up fee and/or a fire hazard. 4.) Be sure to add in the invitation that you will be having a sparkler exit. This gives extra incentive for people to stay and send you off in style at the end of the night. If you don’t want to do it that way, put a chalk board, easel, or other type of signage in a traffic area of the reception for people to see. 5.) Finally, take it slow! Don’t run and rush through the tunnel of sparklers. Walk slow, stop and take a kiss, bow the bride, and relish the moment. You also give your photographers more opportunity to snap away and capture the best images. Wanna redo? Walk back through and do it again! Some of your sparklers will burn long enough if you want to run through a second time.